Yes we ship all around the world. We donate a portion of our profits to to organizations who support the mentally ill homeless, such as Fountain House, NYS Health Foundation, MHA-NYC, and NAMI. Why am I Having Trouble With PayPal? How can I tell the Sizes of the Shirts/Tanks? All the shirts and tanktops have a link to a size chart on each individual items page. Can I model for Schizophrenic.NYC? Can I advertise on Schizophrenic.NYC? Please review our Media Kit and contact us through the contact form and let us know about how & what you like to advertise. How can I contact the founder of Schizophrenic.NYC, Michelle? Just fill out the contact form! She will respond in a timely manner. Where can I find out where you are selling Schizophrenic.NYC Merch? Please refer to the Find Our Pop Ups Page! Question not answered? Please use the contact form and let us know your question! 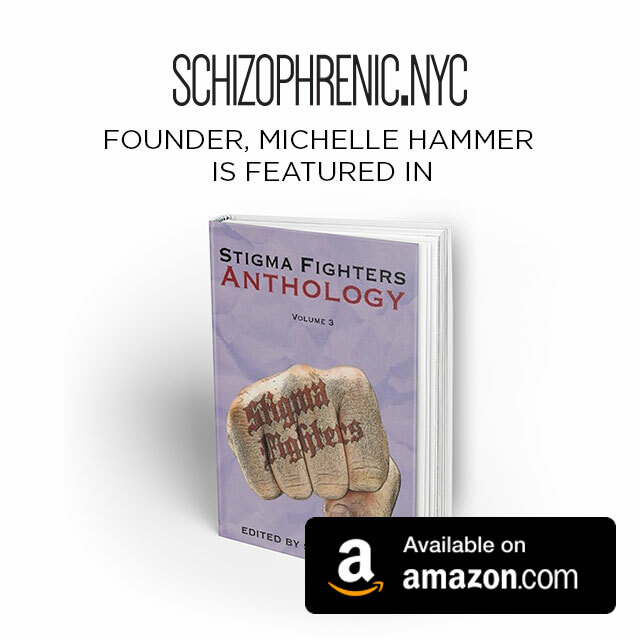 Find Schizophrenic.NYC in Stigma Fighters Vol. 3!